3 Tips For Selling Software & Other Digital Goods Online | BMT Micro, Inc. Selling software and other digital goods online may be one of the most attractive business models today. But, there is a common misconception that building a successful online business is as easy as coming up with a few products to sell. In order to achieve this, you also have to figure out how you are going to deliver your product, take payment, and actually get people to buy it. We’ve mentioned before that the ability to sell and deliver your product online can be one of the toughest aspects of e-commerce. 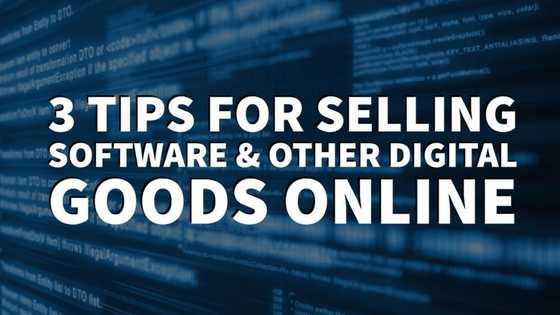 Here are 3 tips that can help you successfully sell software and other digital goods online. It is likely that many of your potential customers have a difficult time deciding which option in your industry is worth their time, money and trust. The selection process can be daunting especially for customers lacking the experience to know what truly distinguishes one competitor from another. However, before you start thinking about which aspects set your business apart from your competition, you need to know exactly who you want to sell to and why. Too often, companies become consumed in their products and forget that it is the customer’s needs, not their own, they need to satisfy. Be proactive and get involved with customers or potential customers in discussions related to your product area. Test your software or digital product with honest groups of people to see how quickly they understand how it works and learn how to use it. These people can help you find potential problems or bugs that you may have overlooked or been unaware of during your development phase. This will give you the opportunity to resolve issues you might have never noticed on your own! Don’t be afraid to ask for feedback as long as you’re careful to make sure it comes from unbiased sources. The opinions of your friends and family don’t often reflect 100 percent honesty. This will also help you improve your product and better understand your customer’s needs. For many businesses today, it is more cost effective to outsource e-commerce needs than to hire in-house staff. It doesn’t matter if you are an independent developer working in your spare time or an established firm with an interest in outsourcing your e-commerce needs, a third-party platform will save you time and money. These platforms (like BMT Micro) allow online businesses to focus on improving digital products and sales rather than investing time, money, and resources into developing and maintaining an entire e-commerce system. As more shoppers become willing to spend their money online, outsourcing helps businesses deliver a consistent quality of services, enhance customer satisfaction and maximize sales. Third-party e-commerce platforms are designed to simplify everything and do a lot of the work for you. So, all you have to do is create your software or digital product and then get paid. The world of e-commerce is only getting more advanced, and just developing a great product will not guarantee success. Keep these tips in mind if you plan on selling software or other digital goods online and want to be successful at it. BMT Micro, Inc. also has every base covered when it comes to successfully selling your product online. We offer a full-service e-commerce solution that will meet all of your business requirements. If you would like to learn more about our services or if you have questions, please feel free to contact our vendor services via email at vendors@bmtmicro.com or visit our website at www.bmtmicro.com.